Now we are using the much better OneDrive for Business Next Generation Sync Client I never had sync problem with this new client, from now on use from here: http://go.microsoft.com/fwlink/p/?LinkId=248256 (version 17.3.6386.0412) this client software support following OS: Windows 10, Windows 8.1, Windows 8, and Windows 7. 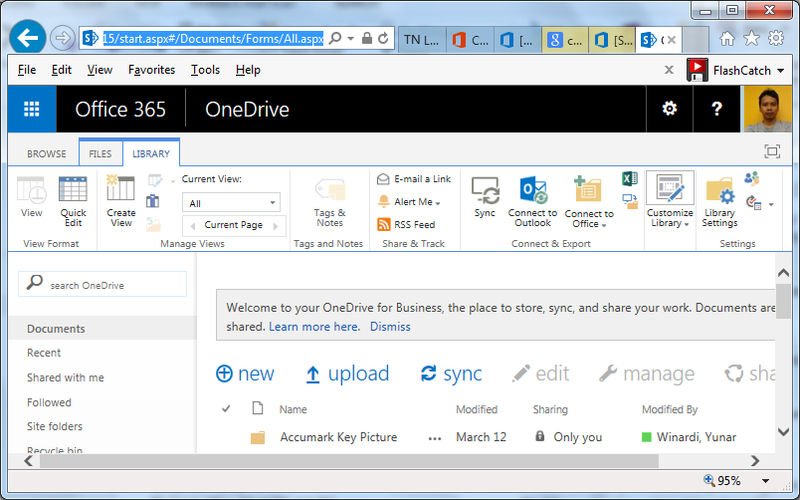 I always recommend to install OneDrive from your office365 portal ( http://login.microsoftonline.com ). However sometimes we need to install OneDrive offline for reason such as slow internet access to client or your proxy not allow you to install online. The last reason is my case. Below are steps required to make offline installer for OneDrive for business using office deployment tool. 3. It will produce a Setup.exe and a configuration.xml file. 4. Create a file to download installation file by make a copy of configuration.xml and rename it as OneDrive_Download.xml. 11. Finish. You just need to double click install.bat to install OneDrive for business offline. If you don’t have time to do above, or you think above steps are too much, you can download all the “ready to click” installation file from link below, https://www.dropbox.com/s/yn12hobhtfh8dup/OneDrive.zip?dl=0(size is 1.04 GB). Extract the file and double click file install.bat to begin OneDrive offline installation. Using this installation file can save you much time especially when install OneDrive on many computers. If you find the Sync Now button is not working (greyed). Go to office365 portal, click onedrive, after open click on library tab as 2nd below picture, copy the URL and paste on below picture. That will do the trick.